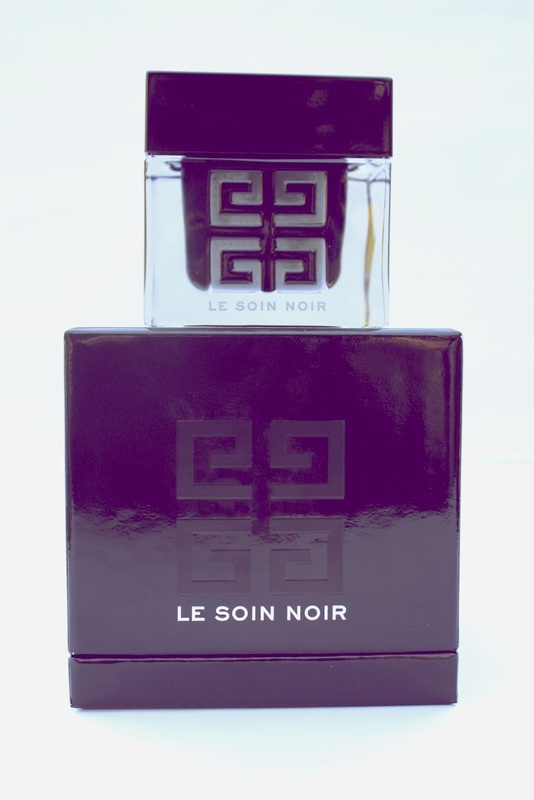 Le Soin Noir is an anti-aging moisturizer, and it says to use it day and night, but it does not dry well at all, so I only use it at night. The moisturizer is made from Vital Black Algae Sap Concentrate is a natural age-defier that "restores communication between the skin's cells", "helps maintain and prolong cellular longevity," and "leaves your complexion firm, glowing, and even-toned" - who doesn't need that?! Vital Black Algae Sap Concentrate is very sensitive, you cannot touch it with your hands or it will contaminate the entire jar - so it comes with a little spoon to scoop it out with! Obviously, I don't use it often - a) because of the price, and b) I'm 18, I don't need expensive anti-aging creams. I only use it when my skin's on the drier side and needs a little pick-me-up! Obviously, I am not a man. This was for my father, and he still does not use it! But I just wanted to discuss how good this smells. It smells like a manlier version of the Swan and Dolphin hotel in Orlando, which is like a fresh-springy-beachy-floral scent. It smells so good! 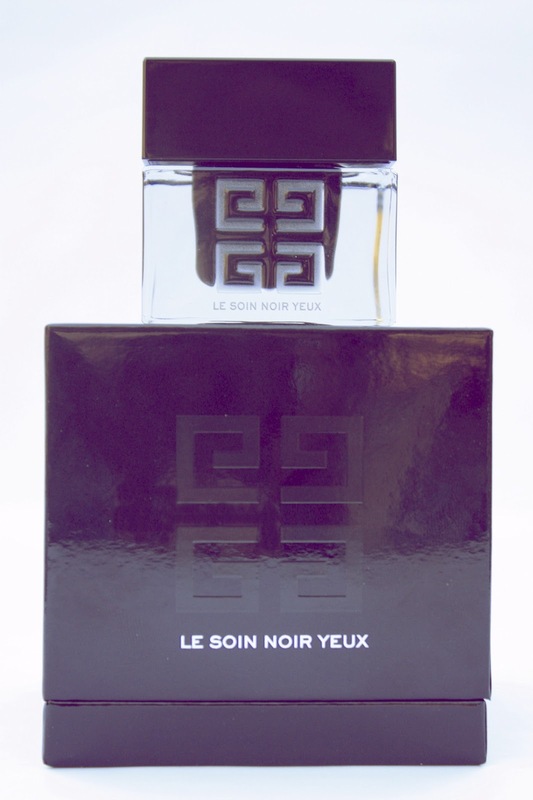 Le Soin Noir Yeux is the eye cream version of the Le Soin Noir moisturizer. It promises what most eye creams promise: "reduce puffiness", "brightens dark circles", "smoothes and evens out the entire eye contour area." I've only used it once, I didn't notice a difference like I did the first time I used the Le Soin Noir, but that is because it's an eye cream, I just didn't want to keep using it when I didn't really need it that much. Umm.. Where do I start with this? It's not bad, it's just not that great. You know? It's okay. I think I just expected more from it. It doesn't have a strong scent, which is good, but I'll definitely be sticking to my Hope in a Jar. 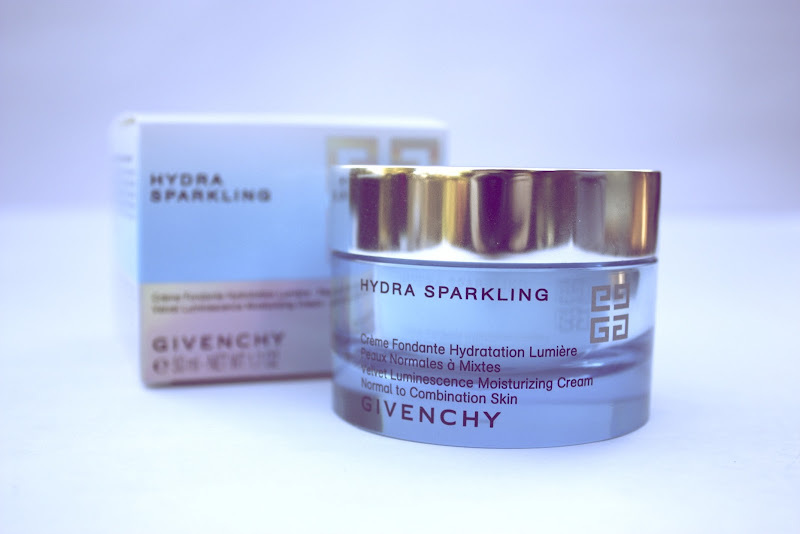 I honestly haven't tried this one, and considering what the Hydra Sparkling moisturizer is like, I probably won't be impressed. Also, funny story, I've lost it since the day I took these pictures.. Can't find it - but it's somewhere around here! When I find it, I'll try it. This came as a free sample, and it smells so good. I'd definitely say it's a scent for all ages, because it's light and floral, very pretty and feminine, but it's also mature. 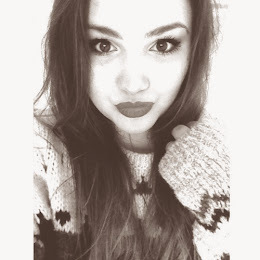 I'm someone who sticks to one perfume until I'm sick of it. I like to have a scent that really captures my personality, so I'll change my perfume when I feel it doesn't fit me anymore. 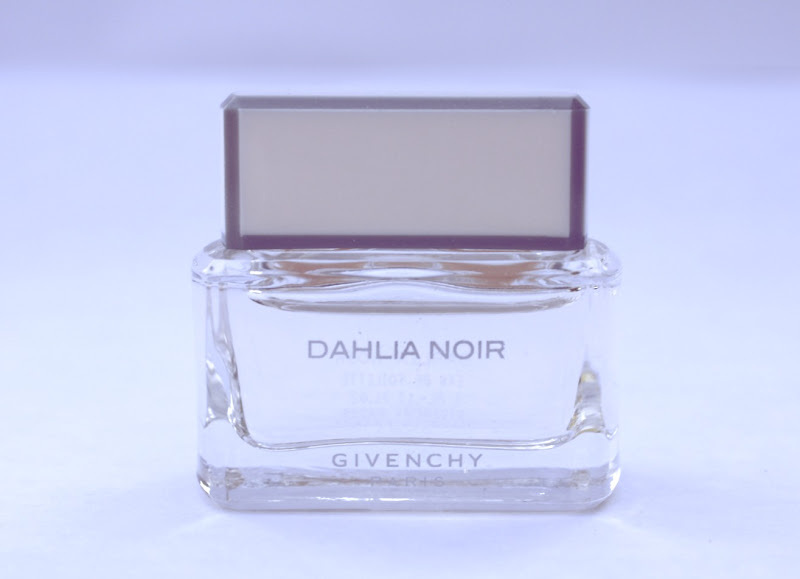 But I know a lot of people collect perfumes, and wear one during the day and a different one at night, or for different occasions - and for those people, I'd say this is a great day perfume, and definitely great for work! These were also free samples, we got two of each, and I have not used them yet. 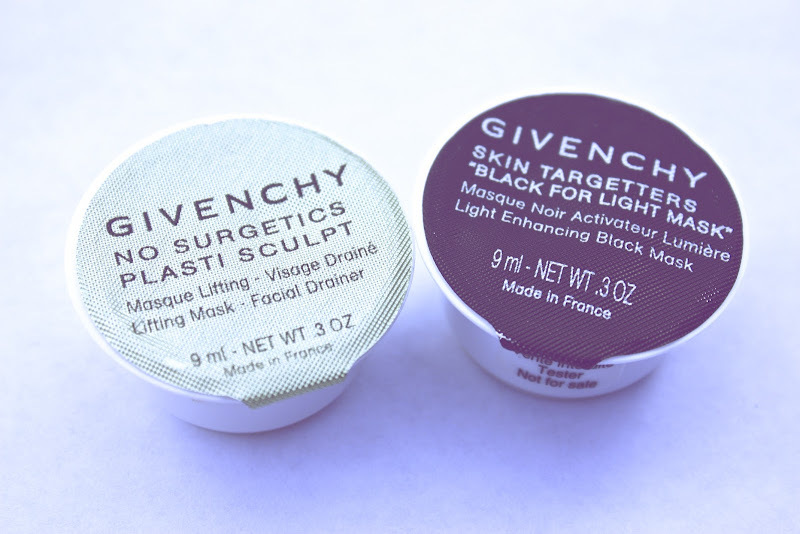 I can not find the No Surgetics Plasti Sculpt Lifting Mask anywhere online - so if you know what it does, please tell me! As for the Black For Light Mask, I'm really excited to use it. It says it is a "unique mask with a black, velvety foam texture and luminous particles that purify the skin," and promises that "after use the complexion becomes amazingly brightened and bursts with freshness and vitality," and "the skin radiates a new glow, as if illuminated from within." And that just sounds nice, and I'm just excited! So have you tried any of these? If you have, make sure you leave a comment, telling me what you thought of them! i've never tried their products but i'd love to! 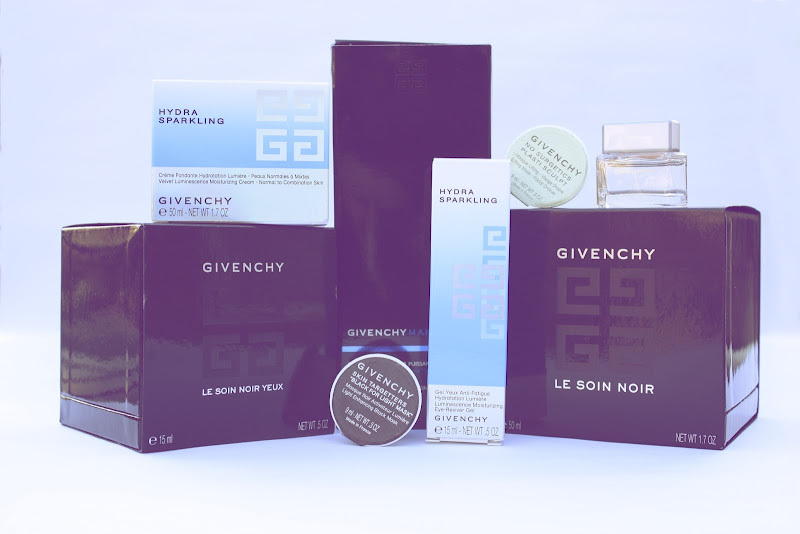 Givenchy always has the nicest packagings. 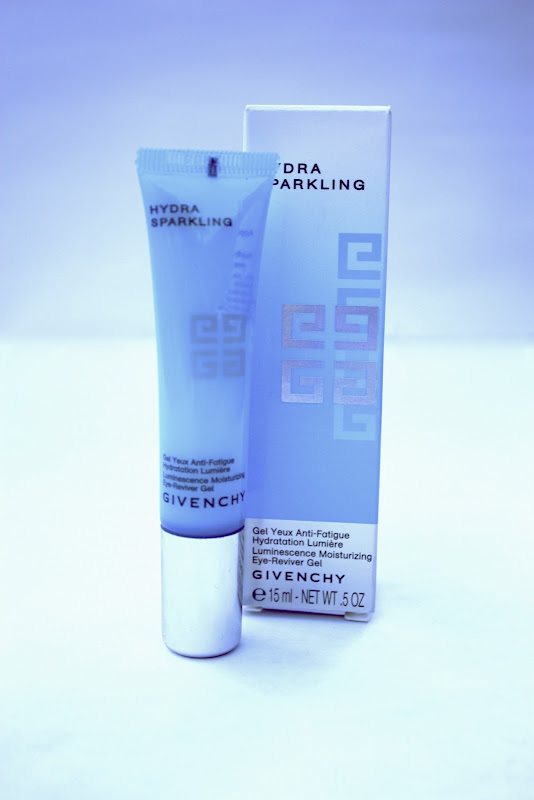 I am not impressed by the hydra sparkling cream as well, but it feels ok and moisturizing so I think it is good. The serum looks pretty sparkling too (as if the cream has micro-glitter in it) and if I use both they make my skin a bit more glowing for a while or so I guess.. nevertheless Iwant their bb cream! Its sold out everywhere.